When you think of hardware for your doors, you're often thinking of beautiful knobs and stylish hinges. You're obsessing about that perfect door, only to cringe when you look at the doorstop. Well, style doesn't have to go out of the window when you're choosing the Homesnest Door Stopper. 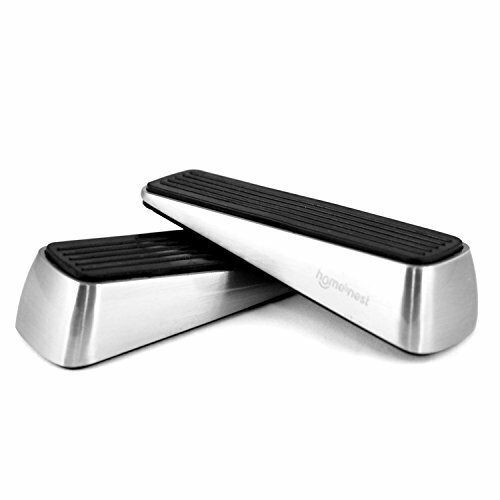 Stunning black and silver colors make this doorstop wedge a dapper design accessory. Its strong base presents a shiny finish which doesn't dampen your stylish décor. It manages to do all this without ever losing out on functionality. It has a height of 0.039 inch (15mm) and a length of 1.57 inch (40 mm) and the stoppers can even be placed on top of each other to hold lifted doors and windows in place. They're even visible at night! Featuring high quality rubber that doesn't wear out with time and solid zinc, this home essential prevents your walls and doors from getting scuffed up. The rubber has even been tested under various conditions to ensure a non-slip experience. The Homenest Door Stopper lasts longer than ordinary stoppers and is thick and heavy enough to ensure that kids don't play with it or pets don't end up chewing it. Well-rounded joints make it a safer choice around children. We're also offering a complimentary finger pinch door guard to ensure safety and protect you and those around you from closing doors. You can finally stop stressing about protecting your pet's tail or your kid's fingers from the strong force of a closing door. These portable door guards are made using soft, flexible and non-toxic materials and are a must have for every home. STRONG AND DURABLE - Made of high quality zinc and rubber, these hard metal door stoppers don't rust or lose their shape over time. WORKS ON ALL SURFACES - Carpets, hone, parquet, marble or granite floors, no matter the surface, these premium door stops don't slip. KEEPS LOVED ONES SAFE - Ideal for homes with a toddler or a pet, this rigid door set also comes with a FREE door pinch guard to protect those tiny fingers. STYLISH AND ATTRACTIVE - This decorative doorstop features a stunning silver and black design that doesn't look bulky or out of place. It even shines at night! MULTI-PURPOSE USE - From stopping a side door, wide door, kitchen, bedroom, home or office door to keeping windows open, this large door stopper kit has so many uses. If you have any questions about this product by homesnest, contact us by completing and submitting the form below. If you are looking for a specif part number, please include it with your message.